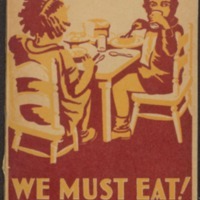 Designed to be read by children as part of the Story Book series of Whitcombe and Tombs, We Must Eat! tells the story of two children, Bob and Margaret in their quest of find out what’s a diet. They are helped through their exploration by Ms Fraser-Smith, who teaches them the difference between a right and poor diet, the importance of vitamins and how to design a ‘just so diet’ (after the Just So stories) There are menu suggestions for Bob and Margaret at the end, to relay to their mother. Stories are powerful pedagogical tools still used today in teaching children about health. Whitcombe & Tombs job no. 18757. "For ages 12 to 14 years"
95 pages : illustrations ; 19 cm.